Whether it's a mid-Missouri road trip or an international adventure backpacking through Europe, traveling is one of my very favorite things to do. In a world that often seems crazy busy and demanding, hopping on a plane or in a car and getting away is one of the best ways that Aaron and I can truly escape. We've never been the best at staycations- they always turn into productive weeks knocking out our mile long to do list. But I love everything about traveling: the packing anticipation, the boarding passes, the photos, the long conversations and fantastic books. Since we're fairly frequent travelers, I've had time to hone my travel favorites (and find new ones). 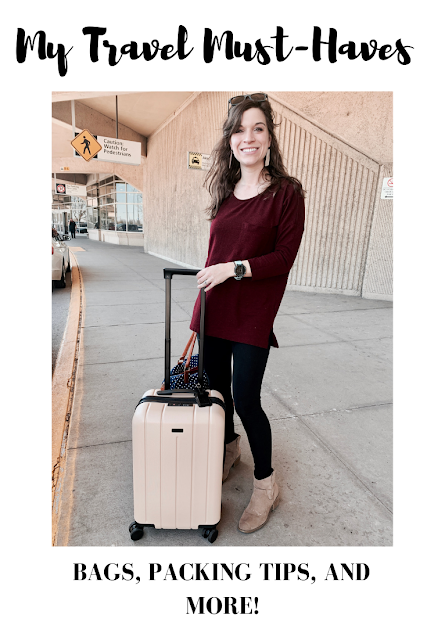 Here are my list of travel must haves! If you're going to be traveling frequently at all, you need a great carry-on. Big suitcases can be nice if you're flying with a pack and play and tons of baby stuff (been there), but carry-ons are always my luggage piece of choice. They're lightweight, easy to check in and out of a bunch of different places, and you don't have to check a bag: which saves time getting in and out of the airport (not to mention, you don't have to worry about your luggage getting lost). You also don't have to pay for luggage if you're flying an airline that charges for that (although we're Southwest people and previously had the Companion Pass, so hit me up if you want more info on all of that)! I recently took the leap to investing in a better carry-on because I was tired of buying something that just fell apart after the first couple of uses. And guys, I'm legit in love with my new Chester Minima Carry-On Spinner Suitcase. So much so, that I ordered a matching one for Aaron (and we aren't those kind of people ha). It's a dream in the airport. I took it on a recent trip and I loved the ease of the zippered compartments, how well it fit in the overhead bins, the little laundry bag that was included, and how cute it looked while being so functional. And it also comes with a 10 YEAR warranty, a 100 day trial, and free returns, so I know I'm covered and working with a great company who believes in a great product. They also offer free two day shipping, and you can use the code 10AF to get 10% off!! Click this link to hurry up and get yours today! I'm seriously SO happy with the bag and can't wait for all the adventures it will be a part of, especially Europe this summer! Since carry-ons are often a little smaller and you're usually only allowed one personal item, I really recommend also getting a small personal bag that can serve as your carry-on bag if you're checking your luggage. I found this bag online and I'm in love. 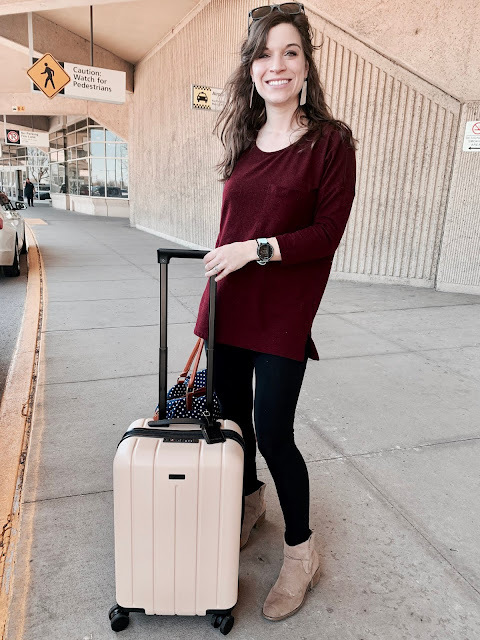 It has a lifetime warranty, and I love the way its little pocket slides down over the handles of my Chester Minima Carry-On so that I can push my suitcase with one hand and move everything I have like it weighs nothing! This bag is a great size to hold my laptop and charger, my purse, a water bottle, some games, and a book. I feel like I always have room for souvenirs if needed. Between this and my carry-on, I could honestly comfortably pack for a week long trip! If I'm going on a little overnight trip somewhere, this is perfect- and it has a nice shoulder strap and longer strap included too if I'm not rolling it on my suitcase (which is my favorite hands-free way to do it). If you're going to be traveling for any length of time, it should be in comfort! Over time, I've learned that comfort doesn't have to mean not cute though! My go to travel outfit is now leggings (unless it's summer) and a comfy top with a layered cardigan or jacket. I also like to wear boots, TOMS, or Chacos depending on the time of year- anything that doesn't have to be laced up. Bonus points if they would have taken up a lot of room in my bag! I also bring along ear plugs because I can't sleep to save my life if there's any noise. And if I'm going to Europe, I do a travel pillow and eye mask! If there's one thing I love about packing, it's trying to see just how much I can fit into my carry-on! Packing cubes are my jam! I love using them to separate tops and bottoms, or sepaarting clothes for me and Aaron if we're traveling together but being strategic about our packing across suitcases (a wise choice if you're renting a car and you don't want to bring in two suitcases each night- pack for the first few nights in one suitcase and then switch). My Travelwise packing cubes have been so great, and have accompanied me everywhere from Branson, MO to Venice, Italy. 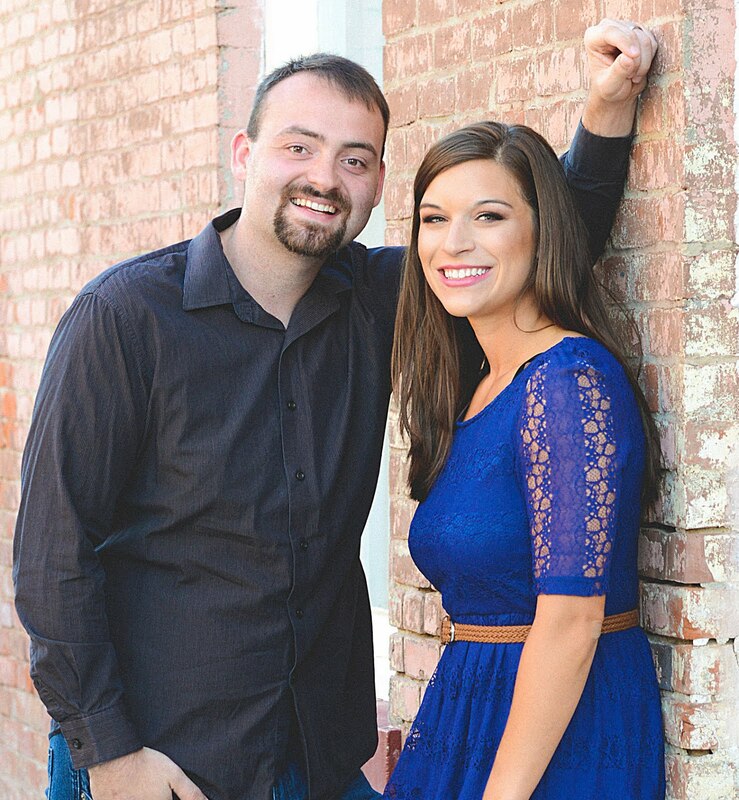 If you'd like to read more about them or my backpack for our Europe trip, click here! I never go on any trip without a solid water bottle. Of course, it's empty on the way through airport security, but then I've sure saved a pretty penny just filling it up wherever I am. Not to mention, I've always had an option ready whenever I got thirsty. Lately, I'm loving my Thermoflask because I can screw the top closed and I don't have to worry about it leaking inside my bag like many other water bottles would. Not everyone may care about this as much as I do, but travel time is prime reading time for me! Whenever I know I'm going on any type of little getaway, I load up on recommended reads from our local library. I brought three books with me on my last trip, and I knocked two of them out. On longer trips, I've packed as many as five books- some in suitcases and some in personal bags. Some people love reading on Kindles, which would eliminate some packing space, but I really love kicking it old school with a paper book. I also would recommend having a cord and a phone with either Spotify or some tunes on it so that you can make the most of your time in the car. I could go on and on about other important things like carry-on sized toiletries and packing games in Ziploc baggies to save space (love me some travel hacks), but I think these are the main biggies! Hit me up with any questions you may have- I LOVE talking travel and probably should have been a travel agent in another life!! Don't forget to use the code 10 AF to save 10% at Chester Travels! Yes to a great water bottle- I just got my first Swell bottle a couple months ago and I'm hooked! Great other tips too! I've heard such great things about Swell! Thanks for reading! All about maximizing space with a good carry on and purse! I love the idea of packing cubes. They must help you stay organized. I will have to order some before my next trip. Thank you for these amazing travel tips. YES! They're life changing. Thanks for reading! It all starts with the right baggage i believe! You need something that fits all of your needs. Definitely! It's a huge help (and way less of a pain when it's light yet sturdy). Love your carry-on! A comfy outfit is a MUST for travelling. I don't know how some people travel in heels and all glam. Haha! I am not yet the jetsetter traveller that I aspire to be for many reasons, but I plan to see as much of the world as possible, so I LOVE a good travel post! A good book is obviously a must have, and I'll definitely have to give packing cubes a try someday! Aww yay. Traveling is the best!! And yes, try them out! LOVE that carry-on. I only pack in a carry-on when I travel. I am so paranoid about losing my luggage. Thanks so much! And me too, totally get that! it all starts with the right luggage, thats for sure! I'm ALWAYS freezing when I travel so I wear leggings and a cardi all the time haha. A good read and tunes are essential! A water bottle and a good book are always at the top of my travel list! I love your bags - they’re so cute! I agree! And thanks so much- I love them too! Great tips. I LOVE travel too and can do 12 days aboard with a carry on. I do need to get a good water bottle so thanks for that suggestion! Thank you! Isn't it just the best!?? And yes, get a good one for sure! I've been wanting to invest in a nice set of luggage. I'll for sure check this out! You really should!! I'm gearing up for my second trip with it and I can't wait! !